I am quickly becoming a fan of Pati Jinich. She offers authentic Mexican recipes with seasoning that is bold and flavorful. When I saw her do this recipe on her television show for meatballs in guajillo sauce I decided I had to make it. I scaled back the recipe considerably, using only a half pound of ground turkey for Terry and me. I used granulated and minced onion instead of fresh onion, and vegetable broth instead of chicken broth (I always do, you know). For the bread crumbs I pulverized some slices of sourdough that were getting old. Beyond that, I pretty much followed the recipe as it was written. 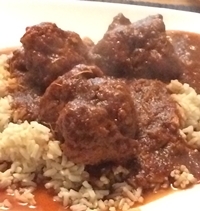 I served the meatballs with brown rice. The result was marvelous. It was a bit of work, but well worth it. Terry certainly loved it.